Mitochondria are tiny cellular organelles that harbor their own DNA (mtDNA). They are the major source of energy for all cellular processes, and also play a critical role in proper cellular function and survival. Mitochondrial disease is caused by genetic mutations that may originate either in the cell nucleus or in the mitochondria themselves. The tissues and organs of the body most affected by mitochondrial dysfunction are those that depend heavily on significant amounts of energy for normal function: brain, nerves, muscle, heart, liver, kidney and endocrine glands. 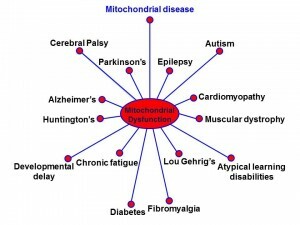 The connection between mitochondrial dysfunction and a host of human disease states, particularly those associated with neurological disorders is just beginning to become apparent (see the diagram below). MitoCure-funded research currently being done at Auburn University inthe laboratory of Dr. Michael Irwin, in collaboration with Dr. Carl A. Pinkert at the University of Alabama and Dr. Kosta Steliou at Boston University, is aimed at testing out exciting new therapies that have high potential in the treatment of mitochondrial disease. Working with rat and mouse “models” of mitochondrial disease, Dr. Irwin and his group at Auburn are evaluating a series of novel small molecules that are designed to neutralize the damage to cells caused by their dysfunctional mitochondria. The Auburn team is also studying the use of a novel targeting method for delivery of a “payload” into mitochondria – either to shift the balance of “healthy-to-mutated” mitochondria or to deliver therapeutic compounds directly into mitochondria. There is currently no cure for mitochondrial disease.